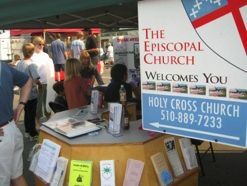 Holy Cross is a modern faith community drawn together in Christian love, fellowship, and support. The environment here is rich with a living spirituality. Diversity of all sorts is encouraged and respected. An expectation of diversity, practiced in a Christian context, has made us a vibrant family, extending our love for each other across generations, gender, race, sexual orientation, and physical or mental ability. All who seek the living Christ in the world today are invited to be our guest. Our history has roots in Hayward and Castro Valley back 130 years. In 1871, the Rev. Edward Warren, a missionary, ministered occasionally in Hayward. By 1886, we become organized as Trinity Mission by Rev. Hamilton Lee. The first service as Trinity Church was held at Luce's Hall in downtown Hayward on October 31, 1886. In 1887, William Pearce donated two lots for the construction of a church building, and the building fund was started. Construction began in the spring of 1888 and the first service was conducted on April 8, 1888. The church then numbered 35 families. The Guild Hall was completed in 1893. A vested choir sang for the first time on May 4, 1893. Records show that the early church had a difficult time in making ends meet and paying the salary of the rector, but they persevered. They were active in assisting various causes and catastrophes that occurred throughout the world. In 1954, Trinity Church moved to a new site on Templeton Street. A new larger Parish Hall and Sunday school building were built and the parish was flourishing. In 1977, Trinity’s world turned upside down. The current rector called a special meeting of members to "repudiate those divisive actions of the 65th General Convention of the Episcopal Church" and to propose that Trinity disassociate itself from the Diocese. On April 2, the rector and vestry voted to begin the process of separation. A month later, 68 parishioners attended a special meeting at the Hill and Valley Club to discuss these actions. In a 65 - 3 vote, they revoked the action taken by the vestry and decided to continue Trinity’s association with the Diocese of California and the Episcopal Church. They sued to have the property returned to the Diocese. The first court decision in 1978 was that the vestry action was legal and the Diocese did not have a claim. In 1980, that ruling was overturned and property was returned to the Diocese. In 1983, the Court of Appeals overturned that ruling and the property was returned to the first group. of Bishop William Swing the two miles to their new home at Independent School in Castro Valley. A building fund was immediately started to buy property and build new buildings. In 1985, Holy Cross purchased an empty lot at Center and Heyer Streets and began the plans for a new sanctuary. In 1988, an adjoining old house was purchased and demolished. Bishop Swing consecrated the new sanctuary on September 11, 1988.